While on holiday, most people are looking to clear their minds and get away from the everyday world. Many are also looking for unforgettable experiences they have never had before. Luckily, Paragliding in Cape Town, South Africa offers the best of both at once. The idea of paragliding is very simple and was first developed by Pierre-Marcel Lemoigne, a French engineer, albeit for military reasons and not for recreational use. You run off a mountain and fly high above the world around you. It is both exhilarating and relaxing. You have an opportunity to soar through the sky and take in the beautiful world all around you, experiencing everything in a spectacular panoramic view that must be seen to believe it. One of the best reasons to choose to go Paragliding in Cape Town on holiday is because the experience is unlike any other. Even for those that are afraid of heights, customers often share stories of the exhilarating and calming sensations that paragliding offers. Cape Town is not only the most popular tourist destination in South Africa; it is also the prime location for holiday goers on the entire African continent. If you are visiting Cape Town on holiday, there is simply no better way to experience its natural beauty than flying off Lions Head or Signal Hill and soaring through the sky. Even if you have never gone paragliding before, there are plenty of ways to experience the adventure. If you feel you would like to participate often, there are training and certification programs offered locally. For one-time fliers, a tandem session may work best. The first priority for everyone Paragliding in Cape Town is safety. While Paragliding is safe for most people, there are inherent risks that come with taking off from a mountain and soaring hundreds of meters in the air for long periods of time. If you choose to fly in tandem, there will be an experienced paragliding pilot strapped in right behind you to ensure your safety. Before you even leave the ground, there are several safety checks we take to ensure a safe flight, all equipment should be properly inspected and checked for any maintenance issues. A trusted licensed professional will regularly inspect the paragliding equipment between flights and before every flight as well. 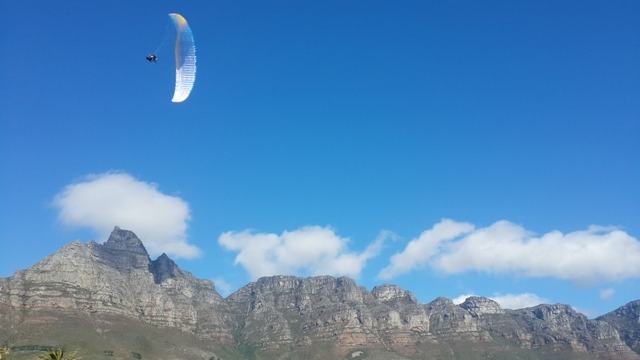 Weather is a very important factor when Paragliding in Cape Town. Clear conditions are obviously preferable, though wind will play a part as well. Unfortunately, there are times when wind or other weather related issues might cause a tandem paragliding flight to be postponed or cancelled. This is part of the business from time to time, and the company that you choose for your paragliding adventure wants to make sure you are safe and that your Cape Town Paragliding experience is the best it can possibly be. After all, it is the best way to see Cape Town  literally!